The most widespread pressure impacting river ecological status is the degradation of key hydromorphologic elements, such as sediment type and flow rate. However, almost nothing is known about the quantitative relationship between benthic invertebrate abundance and these elements. 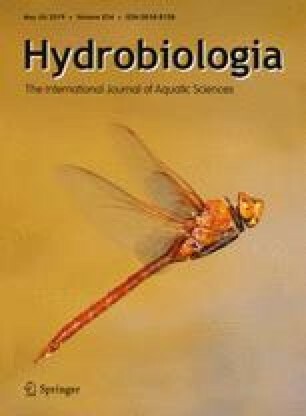 This synthesis compiles quantitative data on physical requirements and thresholds for invertebrates relative to two hydromorphologic factors: substrate size and hydraulic energy (measured as shear stress). Both factors are commonly a focus of river rehabilitation. However, we found only limited literature data that we could use to identify invertebrate preferences (189 taxa). Preferred substrate sizes of all stream epifauna we examined varied between 0.05 and 400 mm and they prefer shear stresses from 0.13 to 3.67 N m−2. There was no difference in variation of preferred conditions between the examined taxonomic levels. We suspect that taxa preferring hydraulic environments with shear stresses < 0.64 N m−2 are affected more by environmental factors than solely being constrained by substrate or hydraulic energy preferences. Such taxa might be useful as sensitive indicator species for evaluating stream integrity. Hence, to optimize restoration success for riverine biota, hydromorphological forces should be mitigated by manipulating habitat complexity in a way that it enhances intact ecological processes. The online version of this article ( https://doi.org/10.1007/s10750-019-3908-9) contains supplementary material, which is available to authorized users. We thank Daniel Graeber for helpful comments on statistics and an anonymous reviewer for his help in linguistic editing of the manuscript. This study was supported by the project REFORM that received funding from the European Union’s Seventh Programme for Research, Technological Development and Demonstration under Grant Agreement No. 282656. Graf, W., A. W. Lorenz, J. M. Tierno de Figueroa, S. Lücke, M. J. López-Rodríguez, J. Murphy & A. Schmidt-Kloiber, 2007. Plecoptera Indicator Database. Euro-limpacs project, Workpackage 7 – indicators of ecosystem health, Task 4, www.freshwaterecology.info, version 5.0 (accessed on 29.11.2012). Meier, C., P. Haase, P. Rolauffs, K. Schindehütte, F. Schöll, A. Sundermann & D. Hering, 2006. Methodisches Handbuch Fließgewässerbewertung. Handbuch zur Untersuchung und Bewertung von Fließgewässern auf der Basis des Makrozoobenthos vor dem Hintergrund der EGWasserrahmenrichtlinie. http://www.fliessgewaesserbewertung.de/downloads/abschlussbericht20060331anhangIX.pdf. R Core Team, 2015. R: A language and environment for statistical computing. R Foundation for Statistical Computing, Vienna, Austria. ISBN 3-900051-07-0. http://www.R-project.org. Sonderegger, D., 2012. SiZer: SiZer: significant zero crossings. R package version 0.1-4. https://CRAN.R-project.org/package=SiZer.